I’m back home in Seattle from a two week (okay, just over 2 week) vacation on our sailboat, Pointless. We cruised the San Juans, up to Princess Louisa Islet and returned home via the Canadian Gulf Islands. 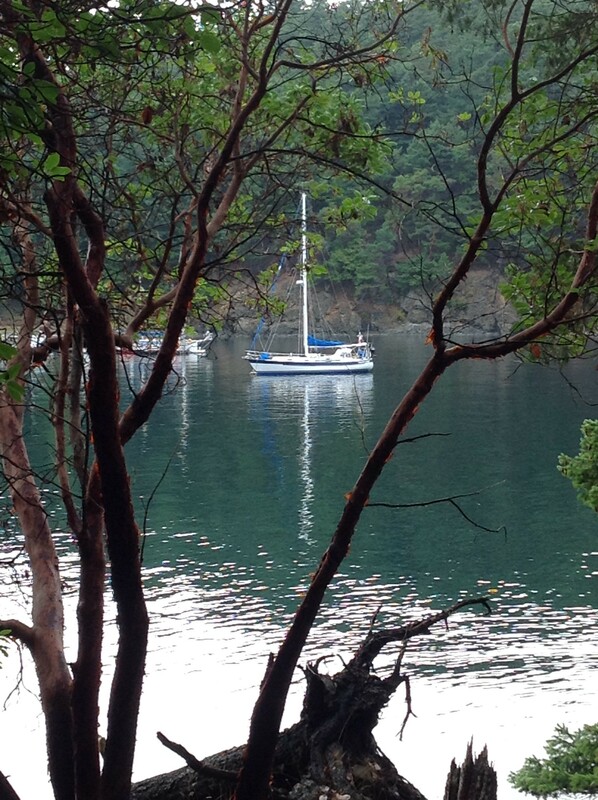 The sailboat is newer to us – we’ve had it almost a year. She’s a Valiant 40 that was built in 1985. We purchased her from the original owners who sailed her around the world while living aboard. My husband has spent the last year lovingly sprucing her up and this vacation was the longest voyage she (or I) have been on to date! One of the best things about having a new puppy in our family has been taking him out on walks to various parks around the area. Yesterday, my husband and I took Scupper, a Flat Coated Retriever,to Washington Arboretum Park. This was my first time visiting this park I’ve probably driven over thousands of times. It’s located under parts of the off-ramps to 520 bridge by University of Washington and the Seattle neighborhood of Washington Park along the shores of Lake Washington. On this visit, we walked around Foster Island and Marsh Island. We are saving the Arboretum gardens for next time. The park is over 230 acres and has botanical gardens that are managed by the University of Washington. You can check out more of photos from our walk to Washington Arboretum Park by clicking here. Yesterday we took our six month old puppy to Lincoln Park in West Seattle for a walk. I thought I’d share some of the spectacular fall colors from my one of my favorite parks. Fall leaves mix with kelp on the wet Puget Sound shore. Last week, on our anniversary, we decided to check out the Olympic Sculpture Park which is located in the heart of Seattle on Western Avenue. I’ve driven by this giant eraser numerous times but this was my first time to get a “close up” at the actual park. Probably my favorite part of the park was the metal tree. Even on a grey Seattle day, the shiny silver branches were striking. This photo reminds me of giant cargo ships. I’m probably more “traditional” when it comes to art. However, I enjoyed strolling through the park on partly sunny day to check out the creations in a natural urban setting. View more of my photos of Seattle’s Olympic Sculpture Park here. Earlier this month we decided to travel to Walla Walla for a "wine weekend". The scenic 4-5 hour drive from Seattle takes you over the Snoquamie Pass via I-90. I relied on an app from the WSDOT on my Droid to provide us up to the minute pass conditions and information on traffic. We like to stop in Ellensburg for lunch at the Yellow Church Cafe; I recommend their burgers and the tuna melt. Ellensburg is a wonderful old town and my husband went to Central so it's a fun place to stretch our legs before heading on towards Yakima (another great area of wine country in Washington) before reaching our final destination. Some of my favorite places we visited this trip are Rotie Cellars, Seven Hills, El Corazon, Basel Cellars and Zebra Cellars. We stayed at the Holiday Inn Express which is actually just on the outskirts of Walla Walla. If you want to be more in town so that you can walk to different wineries and tasting rooms, you may want to check out a local B&B, the Marcus Whitman Hotel or another location. If you have a favorite spot to stay at in Walla Walla or wineries to visit, please comment and let me know! Next time we're planning on visiting Red Mountain. Col Solare is pictured above and they require an advanced appointment tastings. Check out more of my photos of our road trip to Walla Walla. We decided to spend the long Presidents Day weekend at Mt. Baker with our kids for a short family vacation. We rented a condo at Snowater, in Glacier, just minutes from snowboarding, skiing or inner-tubing in the beautiful scenary of Mt. Baker. The condo at Snowater is located just off the north fork of the Nooksack River and did not have internet access or cable tv…yep, we were unplugged for the weekend and it was wonderful! Snowater does have other ammenities (indoor pool, ping pong, etc.) which our kids really enjoyed. A majority of our time was spent on Baker. It takes about 2-3 hours to reach Mt. Baker from Seattle. Do check driving conditions (chains may be required) for Baker. Check out the more of my photos of our Mt. Baker vacation by clicking here. By the way, I used my new Sony Bloggie (pocket camera) to capture these photos. Just a few photos I caught with my Droid-X while we were cruising through Seattle today. With the "s" word in the forecast, we stopped by REI for some mittens and other warm winter wear. The first two photos are of Seattle's historic Steam Plant. You can just see part of Qwest Field, where the Seahawks and Sounders play, to the right of King Street Station from Pioneer Square.